Congratulations to Christopher Mundy at Pacific Northwest National Laboratory and Professor Doug Tobias at the University of California-Irvine on receiving 4 million hours on the Cray XT5 Jaguar supercomputer. The 1.64-petaflop computer, with more than 180,000 processing cores, is located at Oak Ridge National Laboratory. 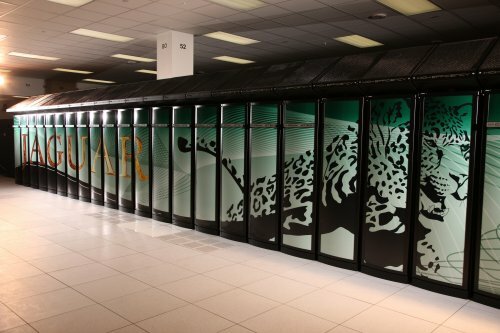 Early access grants on this system help researchers perform great science while hardening the new supercomputer for general use later this year. So, what are Dr. Mundy and his team going to do with all that time on the supercomputer, the fastest computer on the planet for open science? The team will model the chemistry, electron transfer, and polarization of ions at water's interface using density functional theory. "No other model contains all three elements," said Mundy. "And, it is simply too complex to use smaller computer system sizes." Christopher Mundy at Pacific Northwest National Laboratory and Doug Tobias at the University of California-Irvine on receiving 4 million hours on the Cray XT5 Jaguar supercomputer. Credit: Image courtesy of the National Center for Computational Sciences, Oak Ridge National Laboratory. "Because interfaces are where life takes place," said Mundy. The team wants to know if the concentration of hydronium and hydroxide ions responsible for the acidic or basic nature of any solution is the same at the interface as in the bulk. With this insight, the researchers will deliver new understanding to molecular interactions and reactivity that can be applied to intractable energy problems, including catalysis and separations. The research the team is doing on Jaguar at Oak Ridge National Laboratory is funded by the Department of Energy's Office of Basic Energy Sciences.